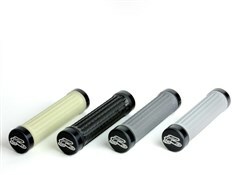 Traction grips are developed for extreme conditions and for those that want additional mechanical grip. Traction grips use an advanced design and need to be set up correctly. With the words 'top' and 'forward' accompanied by some useful arrows, setting up the Traction grips is a cinch. The reason for this positioning is that the grip pattern alternates around its circumference to more effectively interact with each part of your hand. When pulling back on the handlebars, the majority of the grip and torque is concentrated through the fingers. Forward facing, ramped ridges in the finger area give increased grip when pulling back, yet lay flat in normal riding conditions, for improved comfort. When braking or steep descending, the majority of the torque and grip is concentrated through the palm. Grooves cut with a rearward facing angle give improved grip in this situation. As the groove is cut into the grip, it gives a comfortable, large surface area for the palm in normal riding conditions. The grooves and ridges are consistent across the width of the grip, to accommodate riding with your hand in any position on the grip. Be it right in the centre, or with the heal of the hand over the end of the grip, the additional traction is just as effective. Riding in extreme conditions, crashes are inevitable, which can result in the grip getting packed with mud. We designed the grips to have open-ended features, allowing mud to be purged off the end of the grip. Simply push outwards with your hand. For comfort, the thickness of grip material under the palm area has been increased to give improved cushioning. Thinner grip material is used under the finger area to keep the overall outside diameter the same. Left and right specific with forwards and top side arrow markings. Integrated grip body and locking collars for ultimate durability. Smooth profile end transition, for maximum comfort. 130mm overall length, 110mm grip section.